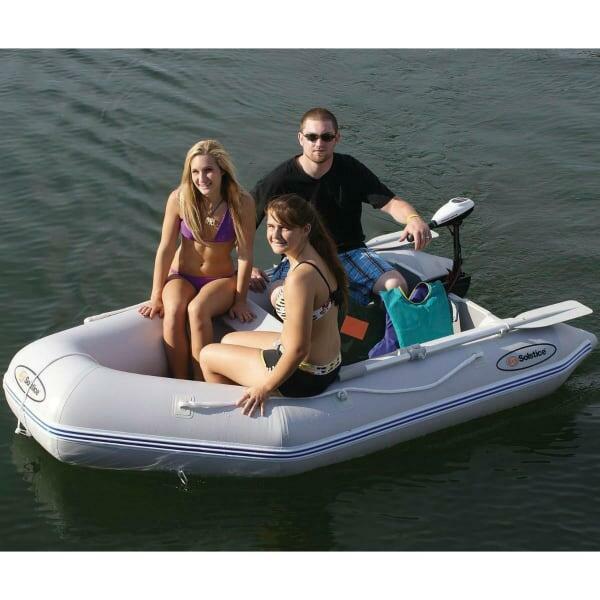 The Sportster 3 Person Runabout by Solstice is an inflatable boat meant for use on the open water. You choose, whether you use it for exploration, putzing around, fishing, or sun bathing. The Sportster boasts marine quality performance, with all of the trappings for fishing, paddling and exploration built in. The Sportster is fitted with ultra durable PVC coated 500 denier 3-ply fabric. It features “D” rings suitable for mooring or towing. The Sportster can run on a motor that you add yourself, or you may paddle. The Sportster 3 Person accepts gas or electric motors with up to 4 horsepower. There are swivel oar locks to keep your oars safely out of the way during times of non-use. The seats are no-rust aluminum for durable comfort. The Sportster comes in different versions with different weight capacities. The Sportster 3 Person is one of the more compact versions, suited to seat 3 people or 595 pounds of weight. And, of course, you’re free to take the Sportster 3 Person out for a solo spin. Make use of the flexibility of a durable inflatable boat! Dimensions 8’ 6" x 4’ 7"